For a second consecutive week, domestic prices remained pretty static on both old and new crop with the former trading above £160/T spot and the latter around £140 for Nov-19 movement. Top spec milling wheat is still in good demand with premiums standing at/close to their campaign highs. Further Brexit news either ‘good’ or ‘bad’ – depending on where you sit – are highly awaited whilst Theresa May is once again (at the time of writing – Wednesday 10th April) on a trip to Brussels asking for new delay but the lack of clarity is paralysing the entire supply chain. 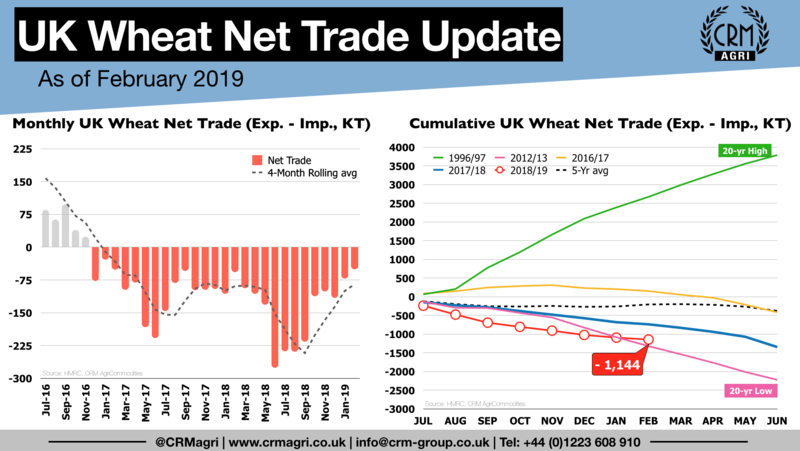 Interestingly though, according to yesterday’s HMRC trade data, the UK remained a net importer of wheat for a 27th consecutive month in Feb-19 but the gap between the exports and imports was at its lowest since January 2017. It was not necessarily because of strong exports (ie less than 40KT) but rather a slowdown in imports which dropped for a 3rd consecutive month to their lowest since January 2016 ie less than 90KT compared to more than 274KT last August. However, the cumulative Jul-Feb wheat imports remain at a 5-year high. Regarding maize imports, a slowdown was also noticed between January and February 2019 but a second consecutive monthly record was scored with nearly 245KT imported of which 58% from Ukraine. 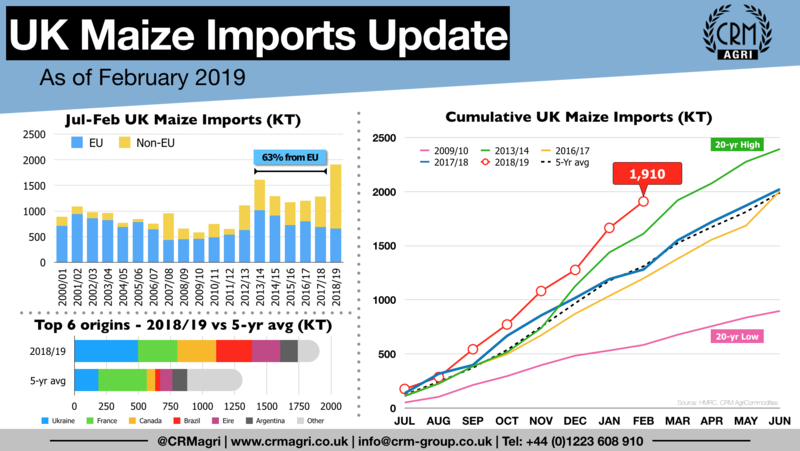 Consequently, the cumulative Jul-Feb UK maize imports of 1.9MMT remain well above the 1.6MMT 20-year high and they keep a lid on barley prices. For more information, please do not hesitate to contact us: info@crm-group.co.uk or subscribe to our concise weekly report here.